In between travelling, family obligations, and other stuff, some sewing is still happening in this house. These past months have been dedicated to finishing some UFOs (UnFinished Objects). I had finally sent off three “leaders and enders” tops to be long arm quilted by Sølvis Quiltestudio, but when they arrived back this autumn, they went into a pile, waiting for me to tackle the bindings. I finally got on top of the task this January. 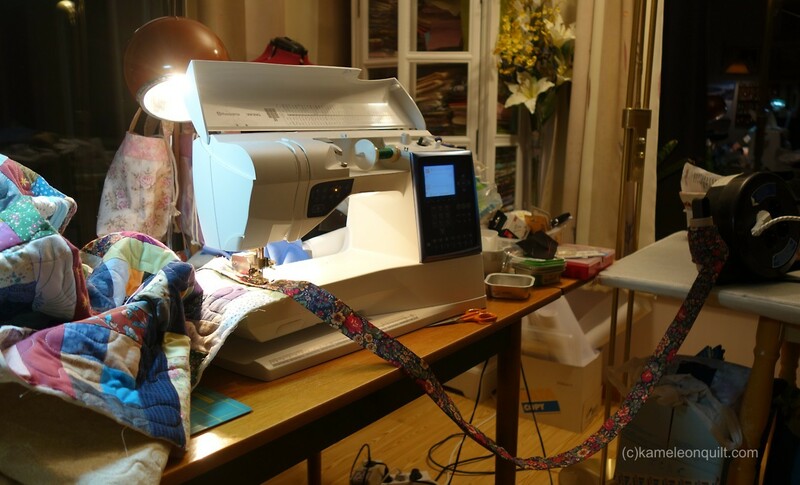 Sewing the first seam by machine does not take long once I get started, and putting the binding on three quilts at once was very effective, – it was done in almost no time at all. However, sewing the binding to the back by hand is a much longer process. I enjoy doing this, but have to do it in short intervals because of shoulder pain. 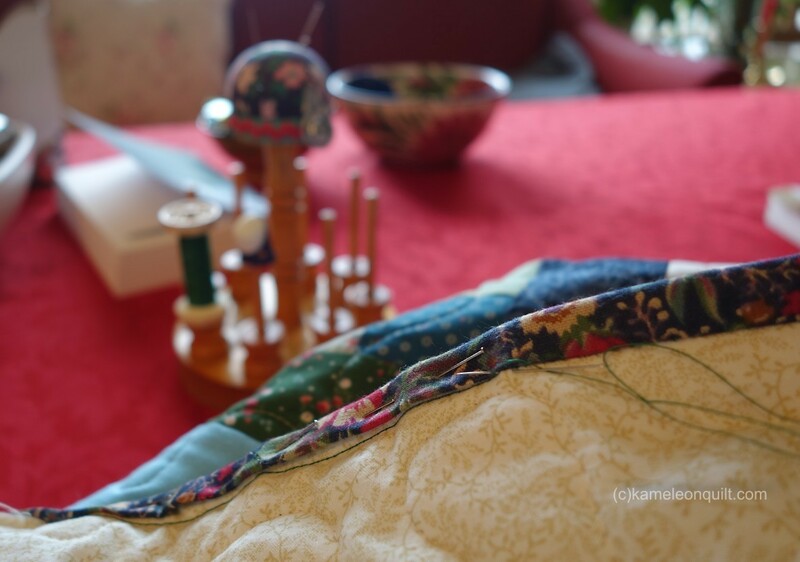 The quilt sits right beside my comfy chair so I can pick it up and do a few stitches whenever I feel like it. 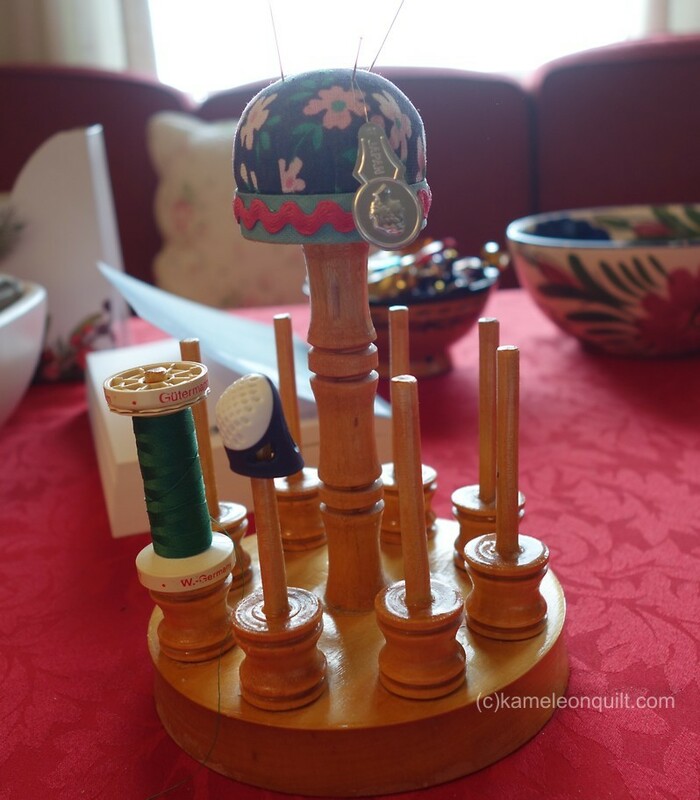 I was so lucky as to get this retro combined pincushion and spool holder as a Christmas gift from a delightful young neighbour girl. I had been looking forward to using it, and it was perfect to sit on the table for such long term on-and-off sewing. 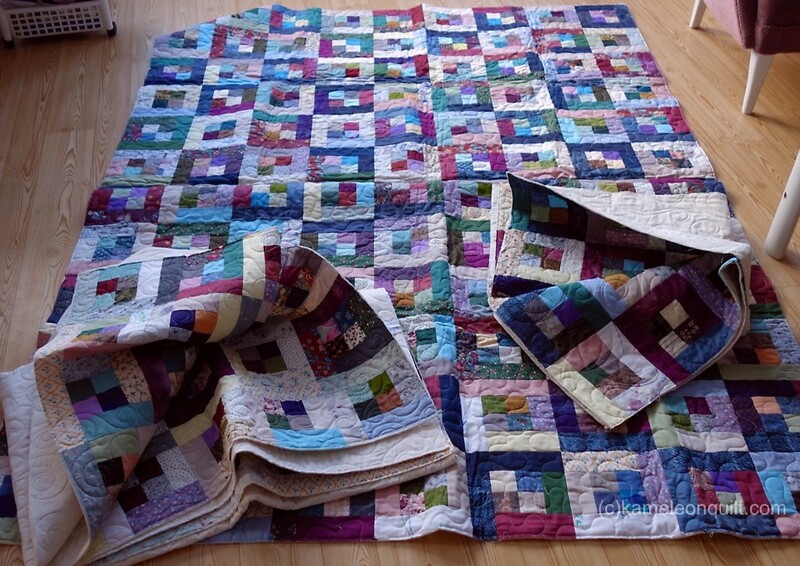 Finally, all three quilts are finished. 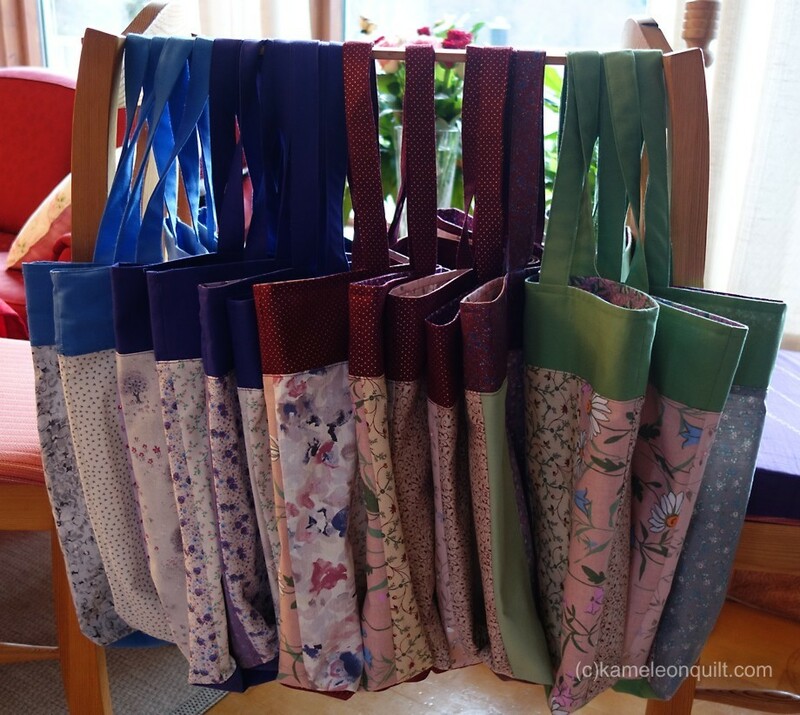 In between, I have also been making some tote bags. Like many quilters, I have aquired lots of fabric over the years, so there is no shortage of material for such projects. It feels good to put it to some use. Most of the bags have been given away to charities and as gifts, but I kept a couple to use for shopping instead of the usual plastic bags. 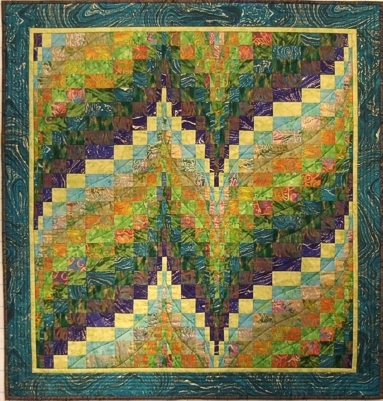 This quilt was part of an online class I taught a few years ago about how to make Bargello quilts. After the classes stopped, there has been some demand for a pattern for this quilt, and now I have finally taken the time to edit the class so it fit into a pdf-document. It is available for purchase through my website. 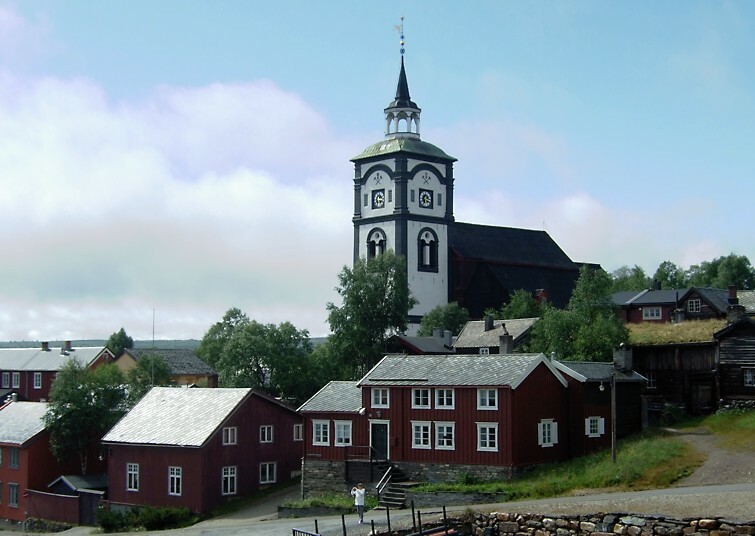 27 years ago my family and I visited Røros during a holiday trip. In the museum there was an exhibition of textile art, and among them were several works by artist Ela Monsen. I was so impressed by her work at the time that I took several photos, using a cheap camera I had at that time, – and also using the expensive film and paper copies of that time. I wanted to remember what I saw. The wall hangings were hung in a room with dark drapes on the walls, and even though my small flash light did its meager best, the photos were only so-so, – even by my then standards. But they were recognizable. A couple of weeks ago, my husband and I visited Røros again, and we stayed at Røros hotel. In the lobby, I was pleasantly surprised to see the wall hanging with the dancing couple hanging on the wall. Of course I recognized it at once, and was happy to be able to see it in better light conditions, and to be able to study the details. Of course I did not think twice about taking lots of photos, – these days photos are cheap. This rendition of a wedding feast is the one I thought most impressive back in 1990, so I was very happy to be able to study it in closer detail. It has not lost its impact since then. Ela Monsen died in 1978, so these two hangings were made just one and two years before her passing. Luckily, some of her works hang in public places so we can continue enjoying them. I mentioned in a previous post that I would post some photos from the Fashion Show in Suzdal, and finally, here they are. The Fashion Show was held on a stage built in the middle of the town square, and was part of the entertainment on the annual Suzdal Day, which is celebrated on the second Saturday of August. They kept going for almost two hours, as participants of all ages were showing more than a hundred different outfits. Because of the crowd of people in front of the stage, it was difficult to get up close, so I had to use the zoom a lot, which lessen the chance of getting clear shots. Below are a few of the outfits. All the information from the stage was in Russian only, so sadly we missed out on a lot of the details. So I will not be able to inform on the names of the designers or wearers of the outfits, except for a few that I have picked up on later. Nina Lee in her beautiful skirt and waistcoat. I believe this is also one of Nina Lee’s creations. Ludmila Charest presents a collection of outfits made in a class with Xenia Dmitrieva. See also video clip below. Many of the dresses seemed to be inspired by folk costumes. Denim was popular, either as new fabric or re-purposed jeans. Note the bird theme. There were a few collections of children’s outfits. They were adorable, – all of them. A few of many, many skirts, coats and jackets. A collection of outfits in an old fashioned style, and with some patchwork details. A couple of fanciful skirts, – very original. I liked them better and better each time I saw them around town during the following days. There was a whole collection with similar dekor. Behind the scenes: Cuddling the baby while waiting to enter the stage. “Backstage” was in reality at one of the sides of the stage, so while the participants were lining up waiting for their turn, some lucky persons got to photograph the outfits up close. Walking around the square after the show doing some shopping in one or more of the many booths, there were some interesting clothing items around to study and admire. The first day of our tour we spent sightseeing in Moscow, and in the afternoon we ended up inside the Novospassky Monastery, where a delicious meal had been prepared for our international group. We were to dine in one of the towers that sit on every corner of the wall surrounding the monastery. The entrance was through a low door in the inside wall, up some long and narrow steps to the gallery, and again ducking through low doors and into the tower room. It was a lovely sight: tables already set with lots of delicious food, old cupboards against the walls holding beautiful pots and crockery, traditional costumes on display, along with various crafted items, – and everything lit only by candles and the natural light coming through the small windows, filtered through blue and white glass. We were told that we were going to have a traditional Russian meal, – as in a feast, – and our guide inside the monastery described each course as they were served: what they were, a little about tradition and production, how they should be eaten, etc. I think there were more than ten different courses, – I lost count somewhere during the meal, – and all of it was delicious; the pumpkin soup, chicken and mushroom pie, pancakes with caviar, fish, pork, cucumber rolls and everything else. We had sweetened mint flavoured juice to drink, – very good after a long and warm day out in the streets. Then there was cake and desserts along with hot tea made from lots of different sour fruits and berries, and sweetened with comb honey. A week later we went into another monastery, in Suzdal, and inside one of the churches there, we laid eyes on another feast. 22 year old Xenia Shlyakova had single-handedly provided a full table of yummy food, – all made from fabric and set onto a large, handmade, table cloth. There were all kinds of food: fish with both red and black caviar, mushrooms, and chicken…..
….. breads in a basket with an embroidered napkin, and decorated bread or cake. Bearing in mind the topic of the festival was Love, and Wedding, this would probably be the kind of decorated bread made especially for weddings. Note the poppy seeds on the braided loaf, – they are all tiny french knots. Of course there were desserts too, – fruit, berries, cake, and cookies. No feast is complete without something to drink. In the bottle there is moonshine, and my guess is tea in the teapots and the samovar. I wondered a bit about the boot on the top of the samovar, but Mr. Google informs me that it is used instead of a bellow to fan the fire inside the samovar. And then the tea is sweetened with comb honey, – everything so neatly made, down to the last detail. One the artist’s beautiful quilts was overlooking the table. Both feasts were amazing experiences, and even though the last one was for the eyes only, it is remembered just as well as the one which we could also taste and smell. Dolls were a prominent part of the Quilt Festival in Suzdal. There was a separate competition category for dolls, and there were also several doll making classes during the week. The dolls exhibition and classes took place in the library building, an interesting sight in itself. I loved the two quilts fitted into the arcs in the upstairs room. The large angel wings, put together from lots of individual wings made by children, was a popular selfie spot. Old doll making traditions seem to have survived and are very much alive and kicking in this country, – maybe because dolls were not seen only as toys for little children, but were also part of traditions connected with adult life. Linda Walsh has an interesting article on her blog about Russian folk art dolls and their use. According to tradition, rag dolls should be without facial features so that evil spirits would not mistakenly recognize them as humans and inhabit the dolls, – thus it would be safe for little children to play with. This old belief implies that dolls at some time must have been regarded as something more than just the sum of the fabric scraps they were made of. There were a few faceless dolls in the exhibition, but most had facial features of some kind. Anyway, regardless of face or not, the dolls were highly individual creations, – not two of them were alike. The amount of work and attention to details were impressive. People could enter works related to the terms “Urban Fashionista”, and also “Birds”, “Fish”, “Bears”, and “Bunnies”. Hence, there was a collection of imaginative, stuffed, animals, and, not surprising perhaps, – also cats. “Angels Everywhere” was another subcategory of the dolls competition. And there were lots of angels and angel wings in many variations. One could also see the main theme for the festival, “Love”, reflected in many of the creations. This charming doll carried a big heart on her back. Svetlana Minina taught classes on doll making at the festival. What she can express through a plain piece of cloth is truly amazing. Her small sculptures are really works of art. I also loved the bird-woman sculptures, also made by Nata Shulepina . According to Wikipedia, these are mythical creatures, some telling the future, and some akin to the Greek sirens. I loved the doll with three pairs of arms and hands. That could sure come in handy on many occasions. The tradition of giving dolls as gifts with accompanying good wishes, has certainly not been abandoned. I have received such gifts on previous visits to Russia, and again on this trip. This lovely doll was thrust into my hands by a fellow quilter on the opening night of the festival. Just like that, for no reason I can think of, other than that we had just been introduced. She is an amazing quilt artist, and the doll now sits right next to my sewing machine. I bought this colourful, small, mat from a lady in a stall on one of the first days. On our last day we ran into each other at the Apple Festival inside one of the monasteries, and she gave me this small doll. We had no language in common other than body and facial expressions, but I understood this was meant for good luck. According to this site, it seems this kind of doll is for wishing good health to the receiver. At the International Quilt Festival in Suzdal there were many different exhibitions located in different venues around town. There were both quilts for the Festival’s different competitions, and also special exhibitions of interesting and outstanding works. Most venues had a combination of the two. The quilts in this post were exhibited in the small church (winter church) to the left, behind the market square trading arcades. The first glimpse through the door looked promising, and we were surprised to find not only quilts in the entrance room, but also some interesting ceramic sculptures, and a large egg covered in mosaics. The medieveal themed quilts were made by Anna Veksler from St.Petersburg, and we were told that the ceramic sculptures were made by someone called Popov. I am not sure about the egg, except that it was beautiful, – that I know. The main room was all painted white and with light coming in through low windows. The building is not in use as a church any more, – not for the time being, anyway. The exhibition in here was also a mix of quilts and ceramics. In the room were a few benches to rest on, and they were also works of art. We were persuaded that it was ok to sit on them, though. They were very solid. One of the competition categories was called “Made by Men”, and those quilts hung in this room. They were all made by male quilters, of course. A versatile collection with some nontraditional construction techniques. There was also a collection of quilts from Japan, made by Yuriko Moriyama. I also liked this work by Olga Bernikova. The front end of the room was occupied by some of Galla Grotto‘s quilts, who also taught some classes at the show. She is an artist with an impressive body of works, – and not only textiles. I heartily recommend a visit to her website. 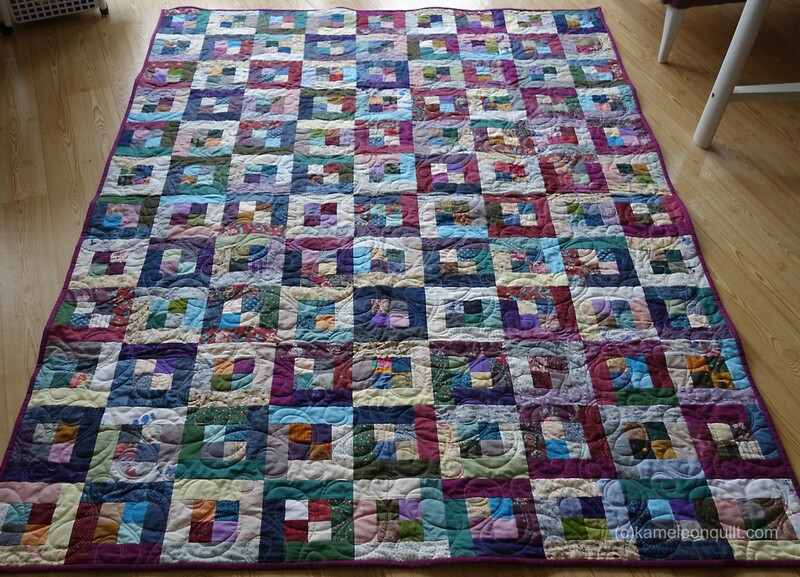 Alevtina Shevaldina made this quilt in the rug making technique. She had one in another exhibition too. There were also several rugs in a special exhibition of old Russian quilts, which I will show in a later post. 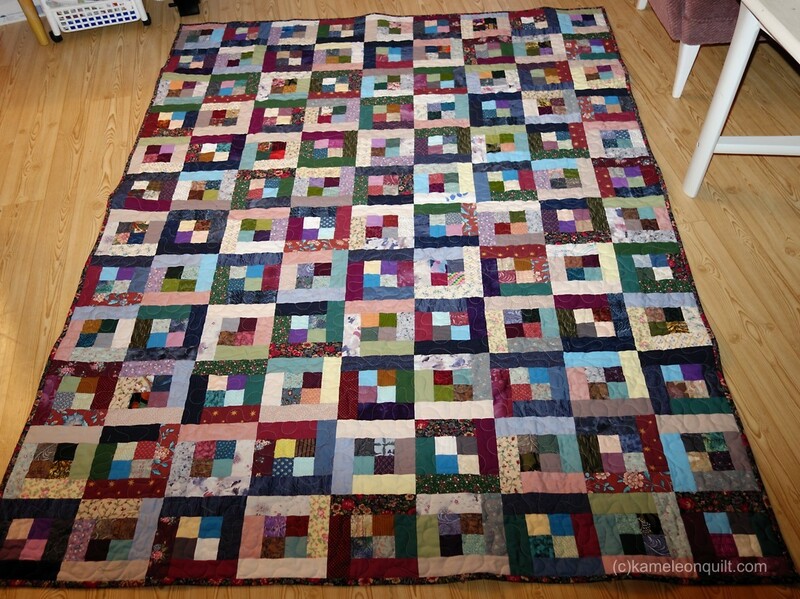 Also, Japanese Keiko Nakamura was inspired by Alevtina Shevaldina’s quilts to make her entry for the Quilted Field. And there were more ceramic sculptures, – in every corner, – and more quilts. 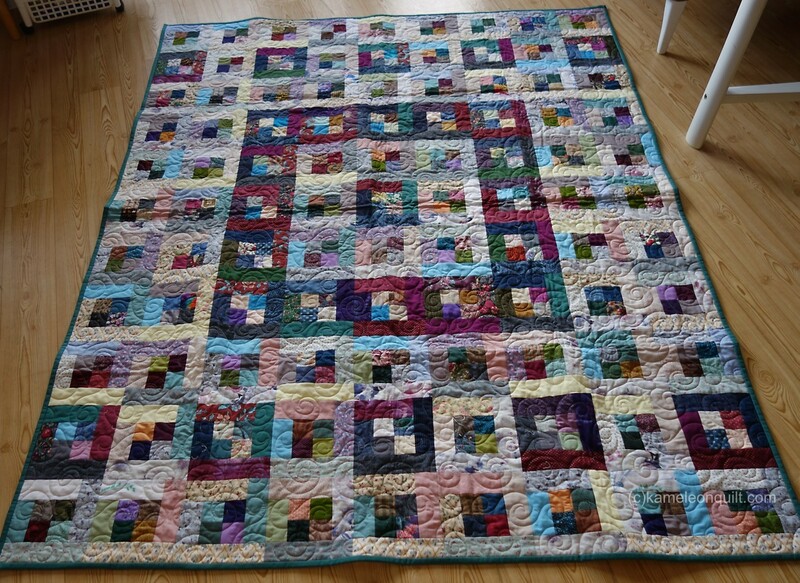 I’ll stop with these photos of Nelly Saveljeva’s quilt.